Electric cars have proven to be a huge draw for manufacturers at the Frankfurt Motor Show 2017. 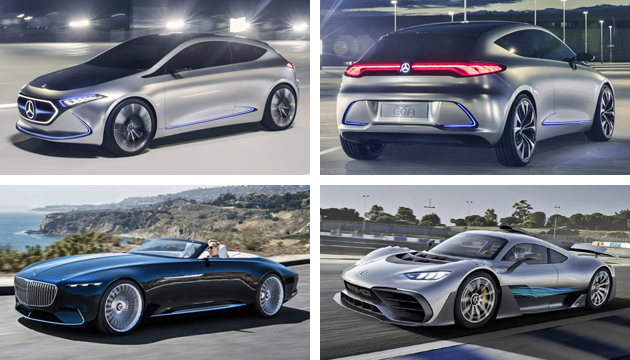 A number of key announcements were joined by new plug-in concepts – most of which will go into production, and the majority are also pure-electric. Below Zap-Map has listed its pick of the electric Frankfurt stars in no particular order, with all but one a pure-EV – and that exception is a hydrogen plug-in hybrid. One of the undoubted stars of the show – and probably my favourite if I had to pick one show star – is Honda’s all-electric concept. Confirmed for production in 2019, the stylish supermini looks great and will be a huge sales success if the reaction from Frankfurt is anything to go by. 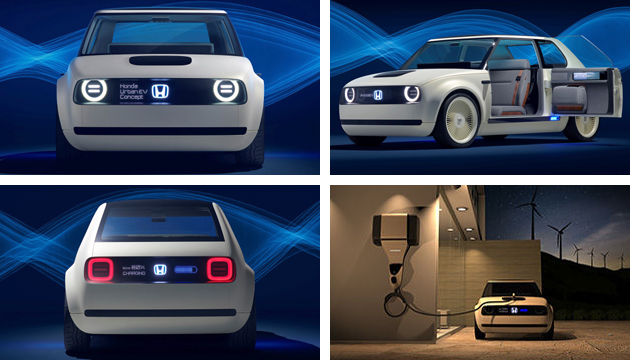 No powertrain details were released, but the Urban EV Concept was shown off featuring vehicle-to-grid technology, running alongside an all-in-one unit from Honda allowing two-way transfer of energy from the EV. Mercedes has had a superb Frankfurt from an electrification point of view. Alongside the EQA was showcased the Maybach Vision 6 Cabriolet concept, the soon-to-enter production GLC F-Cell FC-PHEV, smart vision EQ, and the show-stopping AMG Project 1 hypercar which borrows its powertrain from Formula 1 – hybrid unit and all. However, most promising from a buyers point of view initially – at least until hydrogen infrastructure becomes more widespread – is the EQA. Confirmed to go into production as the entry model of the Mercedes EQ range, it shares the all-electric blueprint of the EQC. A premium compact hatchback in the mould of the current A Class, the EQA has a sporty outlook, and 250 mile range from a 60+kWh battery. Another model that’s set to bolster an all-electric brand like the Mercedes EQA is the VW I.D. Crozz. Following on from the I.D. hatch and I.D. Buzz, the I.D. Crozz will go into production as the third in VW’s new electric car stable. 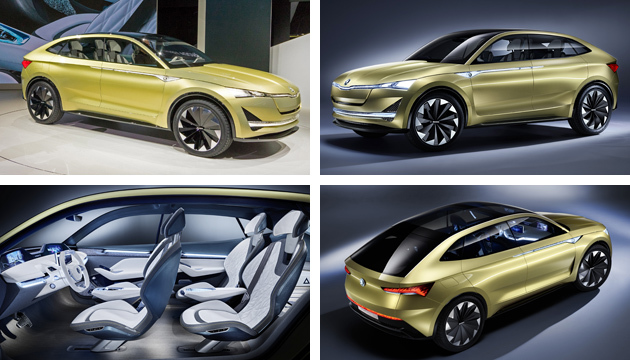 A family-sized crossover, the I.D. Crozz will go into production in 2020 with four-wheel drive, 225kW of power, and 310 mile range. 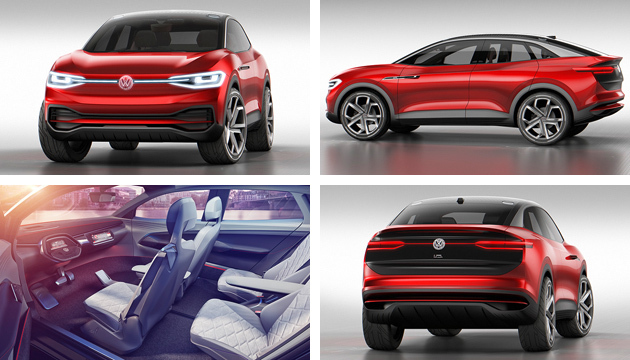 Intriguingly, VW claims that the tall crossover will offer similar driving dynamics to the Golf GTI. If it achieves this, expect many a young family car buyer to be drawn to this EV with practical range and fun driving dynamics. As you will no doubt have gathered, an electric brand is de rigueur for German manufacturers particularly, with BMW no different. The difference is that BMW’s i Division is not only already here, but also well established. The i Vision Dynamics is confirmed to be the third i Division model set to be produced, with a conventional saloon shape – BMW’s claiming Gran Coupe, but that just means it’s a sleek saloon. Avoiding comparisons with the Tesla Model 3 as much as possible, the i Vision Dynamics is expected to be called the i5 in production form, and will use the next generation battery and motor technology, while also ushering in a few new BMW design details. A range of 373 miles is going to convince many an exec to switch from the ubiquitous 3 Series into the zero-tailpipe emission i saloon when it goes into production. 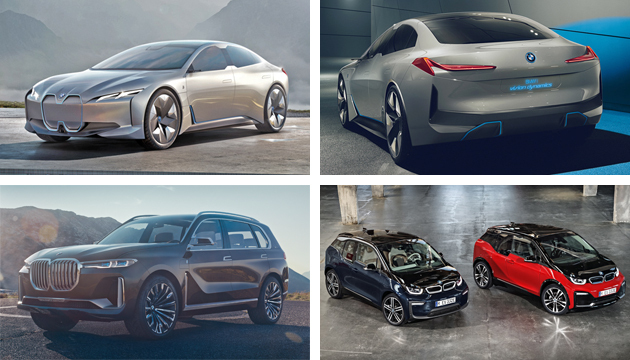 Joining the i Vision Dynamics at Frankfurt were BMW’s new i3 (above bottom right), with the Concept X7 iPerformance SUV (above bottom left) also debuted at Frankfurt, creating a very strong electric line-up for the Brand at its home show. 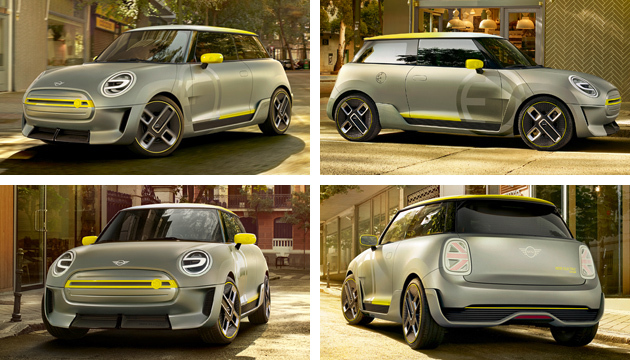 Sticking with the BMW Group, Mini premiered its Electric Concept at Frankfurt, with the showcase model previewing a full-production version due in 2019. Full of ‘British’ design elements, the EV has made extensive use of 3D printing and lightweight components to maximise efficiency. Powertrain details are yet to be announced, but BMW is pushing its electric technology development hard, and the Mini brand is a key element of those plans. A Mini EV will suit the brand’s elements well, providing a nippy car, ideally suited to town driving, with a low centre of gravity for that famous Mini handling. Another brand pushing hard on electric development is Jaguar Land Rover. Execs at Frankfurt confirmed that the Range Rover and Range Rover Sport will be available as PHEVs by the end of the year, but on show was a sportier model still. 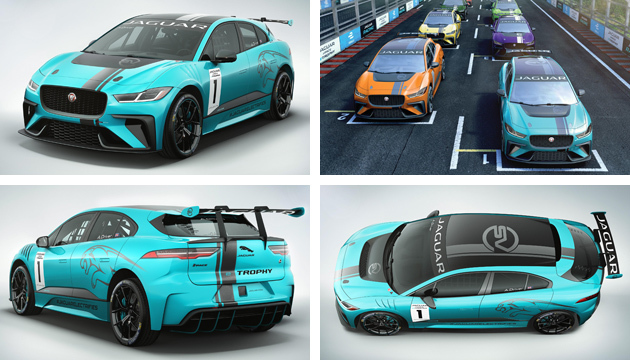 The I-Pace eTrophy racecar will be built for a one-make series to support the Formula E championship. Based on the all-electric I-Pace, the eTrophy model is not going to be available for the majority of drivers. However, with JLR’s recent electrification announcement, plug-in Rangies coming soon, a full-works Formula E team, and a pure-EV on the horizon, the British brand is working full-steam ahead (if you’ll excuse the contrasting technologies) on electric models. There are two ideas that are big business currently in the automotive industry if Frankfurt is anything to go by – SUVs and EVs. Skoda is another brand that has combined the two in the shape of the Vision E concept. Presented with autonomous driving capabilities, a 225kW four-wheel drive powertrain, wireless charging, and electric range of more than 300 miles, the Vision E is a strong start for Skoda’s electric ambitions. Granted, this isn’t a pure-EV, but the hydrogen fuel cell plug-in hybrid – to give the Mercedes it’s full technological title – could well prove more important than the likes of the Chery Exceed TX, which nonetheless deserves an honourable mention in EV form. Getting back on track, the GLC F-Cell is a plug-in hybrid in the sense it only has a short battery electric range – about 30 miles. 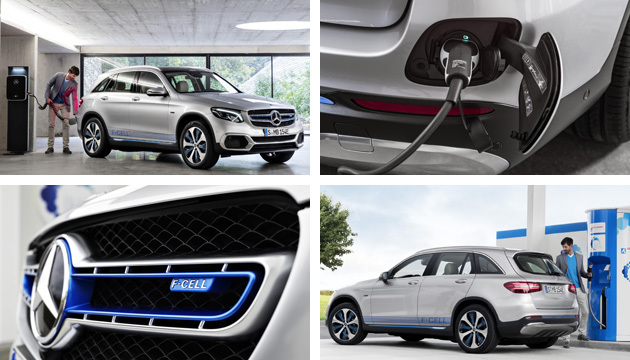 Instead of a conventional PHEV’s petrol or diesel engine though, to extend that range the GLC F-Cell uses a hydrogen fuel cell stack powertrain to power the car once the battery’s drained, or charge said battery. The fuel cell stack powers the same battery and the same electric motors, producing only water as a tailpipe emission, currently providing – well, due soon – the only plug-in electric car that can be refuelled in just a few minutes with zero-harmful tailpipe emissions. We end with the ‘high concept’ models of Frankfurt; those never likely to see the lights of a production line, but hopefully will influence designers and engineers in the near future. 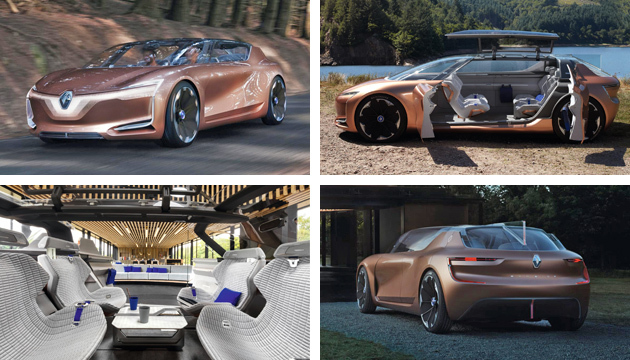 Renault’s Symbioz is supposed to be an extension of our living space, providing an ‘extra mobile, modular and multi-purpose room’ when parked inside the home, and an ‘extension of the home on the road’. Renault had to showcase an entire home at Frankfurt to allow the Symbioz make sense. Yup, very ‘blue-sky thinking’ but importantly Renault has both a long history of concept cars having major influence on future direction, and well-recognised expertise in electric vehicles. For this second part, the Symbioz features wireless charging and a 72kWh battery pack, allowing for a real-world range of more than 300 miles in motorway conditions according to Renault. With 500kW of power and 660Nm of torque, the Symbioz doesn’t lack for performance either, and the interior adapts for autonomous driving under regulations expected by 2030. A different take on the autonomous EV is Audi’s Aicon concept. Four in-wheel motors provide a combined 260kW and 550Nm, with each corner able to be controlled separately without the need for an axle. This allows Audi to offer a variable quattro four-wheel drive system for performance whatever the conditions. Audi’s quote is a range of around 430 to 500 miles on a single charge, also topped-up wirelessly. Most eye-catching though is not the huge 26-inch wheels (to give a sense of scale), but the fact the car only features four wheels in total, eschewing a fifth wheel commonly used for steering. Autonomous driving removes the need for one argues Audi, and as such the Aicon’s cabin is more akin to an airport lounge than a car interior.